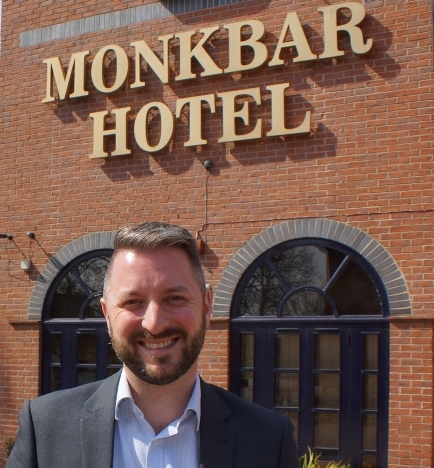 A York hotelier is urging colleagues throughout the sector to support a charity dedicated to helping those connected to the UK’s hospitality industry. Graham Usher, general manager of the city’s Best Western Monkbar Hotel and chair of the city’s hoteliers association, made the plea in light of staff coming under increasing pressure brought about by a nationwide recruitment crisis. Mr Usher, who has worked in hotels since his teens, said: “When it comes to charity, the hospitality industry is incredibly supportive, be it from the staging of events to staff undertaking various sponsored challenges. “However, what we aren’t very good at is raising money for our own charity, one that work specifically with people who work or have worked in catering. “Hoteliers are under increasing pressure due to a national skills shortage, and this is leading to workers suffering stress as they have to take on more duties and work extra shifts. “Sadly many are finding solace in alcohol and drugs, and depression is also on the increase. Dawn Holding, regional co-ordinator for the North of England with Hospitality Action – a charity which offers vital assistance to all who work, or have worked within hospitality in the UK, and who find themselves in crisis – said: “We are delighted that Graham is asking York hoteliers to support us. Founded in 1837, Hospitality Action supports those suffering from life altering illnesses, experiencing poverty, bereavement and domestic violence, and those who have retired from the industry who may be isolated. The money it raises goes towards giving grants for essential items including food, equipment and central heating, supporting often isolated and lonely retired hospitality workers and running educational seminars advising catering students of the dangers of drug and alcohol misuse.